Summary: Last year Coastal Biology, Inc. became the first group to conduct public sea turtle walks in Vero Beach, Florida. Though we were almost entirely booked and we had success showing nearly 300 people a nesting loggerhead, we had to borrow basic office equipment and lacked sophisticated field gear to help identify turtle nesting behavior from a distance. 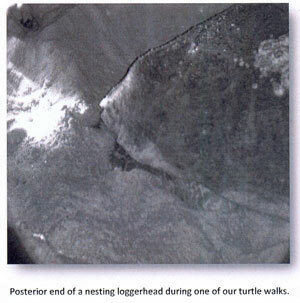 The project will allow us to purchase of a night vision monocular, laptop computer and projection screen to conduct turtle walks in 2015. The night vision monocular will allow us to safely observe turtles from a distance, avoid spooking them and see hidden obstacles on the beach that might be a hazard. The purchase of a laptop computer and projection screen will free us from borrowing this equipment and give us the flexibility to give presentations in venues lacking these devices. The purchase of pieces of equipment will provide ownership, flexibility and enhancement in our public education program focusing on the biology and conservation of sea turtles along the east coast of Florida. Results: This was the second year Coastal Biology, Inc. successfully offered sea turtle walks to the public in Vero Beach, Florida. We conducted eight walks this year out of the Indian River Shores Community Center with a 75% success rate at showing 197 people a nesting loggerhead sea turtle. Just under one quarter of those people (22%) were children. The purchase of two night vision scopes through this grant helped us to identify the location and nesting stage of loggerhead turtles and, because of the relatively higher number of green turtles nesting this year, determine the species of the turtle from a safe distance.